You also will find two other kinds of horses: Zombie Horses and Skeleton Horses. These animals wander around the world, without any specific direction, they usually stop to eat grass. They open the mouth and whinny. Horses, Mules and Donkeys need to be tamed before mounting them. You can tame them by giving sugar, apples, wheat, bread, gold carrots or gold apples (last one is the most effective to tame a horse, a 10%). Horses can recover life by feeding with the mentioned food. Horses, Donkeys and Mules can be mounted with a saddle. You can even wear horses with armor. 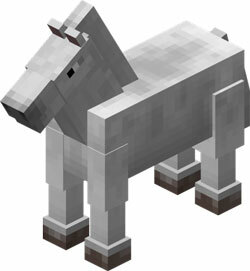 From all the spieces, Horses and Donkeys are only the ones which appear by deafult in the Minecraft’s Overworld. Mules are breed with a Horse and a Donkey.